Work brought me out to California this week, so no flying other then trying to survive in a crowded 747. Yesterday morning the Wall Street Journal that the hotel hands out had a large Land Rover ad titled "From Monte Carlo to Gourdon". Otherwise I don't care at all about large, gas goggling, status cars; I'm perfectly happy with my tiny-diesel powered Ford Fiesta. 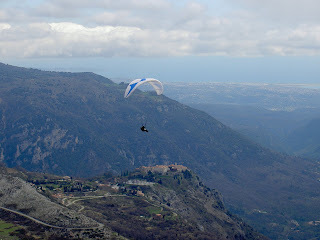 But that phrase struck me as both Monaco and Gourdon are famous beautiful sites for paragliding. I visit the area at least once a year: end of August my friend Harri "Hapa" (www.flyhapa.com) and I will guide a group of 8 Finnish pilots into La vie en France! We base ourselves at our favorite Gite in the Sun in Greolieres, but expect to fly almost everyday also at Gourdon. And hopefully we can get everybody to fly at least once above Monaco. That is a pilgrimage that every pilot should make once in a lifetime! The Land Rover website has this short promotion video which shows the breathtaking landscapes. 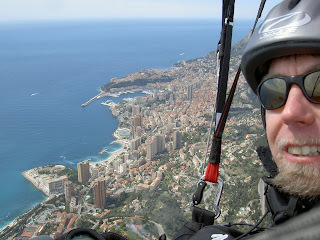 The picture above has me flying above Gourdon, whereas down below Hapa flies above Monaco (pictures by Hapa). Expect more news from these places in a couple of weeks!